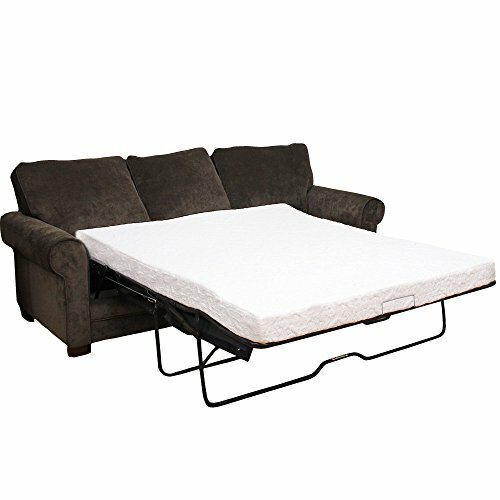 Are you looking for a comfortable sofa bed for when your guests visit? Are you working with limited space and searching for the most efficient option that will double as both a couch and bed? If so, you’ve come to the right place. Our top pick for the best sofa bed is the Ashley Homestore Larkinhurst Sofa Sleeper. It has a rustic design, flippable pillows, and a queen-size bed with a comfortable mattress, all for an affordable price. 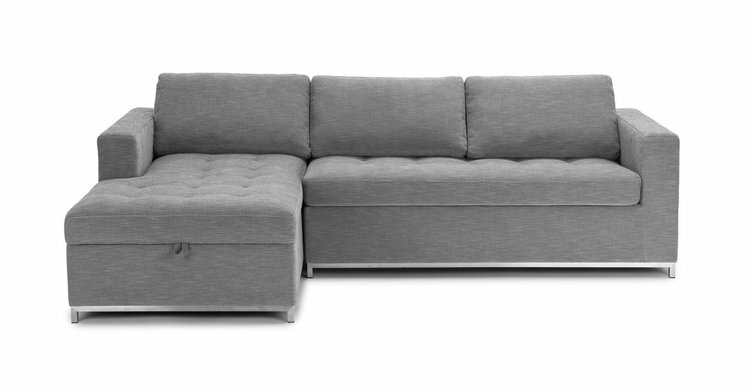 Our runner-up pick is the Soma Sofa Bed, which is quick to assemble and made with sturdy foam that should last a long time. Sometimes, it’s necessary to make sacrifices with regards to space in your house or apartment and having a couch that pulls out into a bed will make this a lot more convenient. Whether you plan to use your sofa bed as your main resting place or you just want sleeping space for your guests when they come to, a sofa bed is a smart furniture choice. Sofa beds (also known as pull-out beds) have been a popular living room option for quite some time, due to their convenience and compact style. But anyone who’s spent the night on one knows that they aren’t always comfortable. Thankfully, you don’t have to put up with discomfort, as there are comfortable, high-quality fold out bed options out there. Below, we will cover some good pull-out bed choices that will have your guests waking up rested after a good night’s sleep. We tried to include mattresses made with a variety of materials, so you should be able to find one that fits your needs and preferences. The Soma Sofa Bed is made with tufted seat cushions and high-quality upholstery and comes in neutral colors that will match most living rooms. The couch is made from dense polyester-wrapped foam, while the mattress on the pull-out bed is made with memory foam. The couch has sturdy metal legs and a durable feel, overall. Although the Soma Sofa Bed requires assembly, it’s fairly straightforward and shouldn’t take long. Reviews state that the couch is a bit firm, so make sure you like that feel before you select this option. 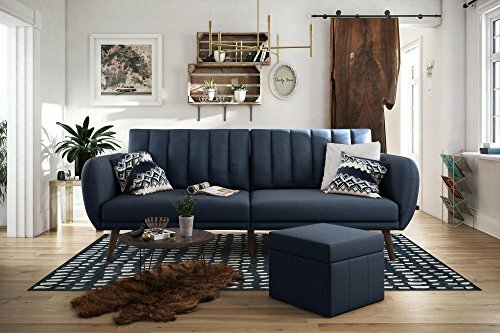 The Soma Sofa Bed is a good choice if you want a nice couch that pulls out into a bed but you have a bit of space since this pick isn’t small compared to other sofa beds. It’s a durable, stylish option that should last you for years to come. While this option isn’t the cheapest sofa bed out there, you tend to get what you pay for and it could be a great investment if you can afford it. The Signature Sleep Devon Sofa Sleeper is a space-saving pull-out bed with a modern look. It has a twin-size memory foam mattress included, made with CertiPUR-US® certified materials for your guest’s comfort. You can expect assembly to take about 20 minutes with this couch. Although the included mattress is only 3-inches thick, you still probably won’t get the dreaded bar-in-the-back feeling that so often comes with futons, since it’s made with a quality material. Extra sensitive people may require a mattress topper, though. The legs on the Signature Sleep Devon Sofa are solid wood, while the sleeper bed is spring assisted and easy to fold out. The bed can hold up to 600 pounds and has an attractive look at an affordable price. Overall, if saving space is a top priority for you but you also want a stylish option, the Signature Sleep Devon Sofa could be a good choice for your house or apartment. If saving space and budgeting are two of your top concerns with your new sofa bed, the DHP Dillan Convertible Futon just might be your best bet. It has a sturdy wooden frame, stylish, tapered legs, and works for lounging, sleeping, or sitting. It has a very compact design, so keep in mind that it may work best for those of average height or shorter, rather than taller people. The DHP Dillan Futon will arrive boxed up and requires some basic assembly, which shouldn’t take very long. If you’re switching from an average-size sofa to this, you’ll likely find that you have more extra space in your apartment. 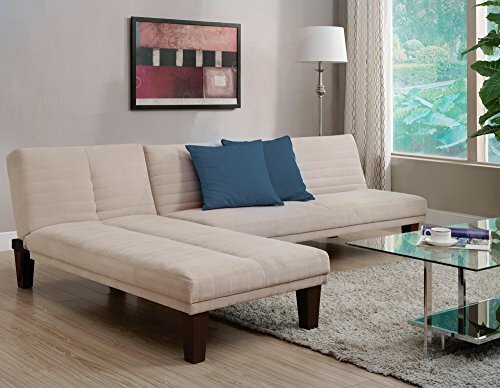 This futon has a low profile and is covered in a microfiber fabric in a neutral shade. The mattress is fairly thin, so you may want to use a topper with it. This couch is small enough to fit in your office or put in your kids’ room. When it arrives, just snap on the feet and it should be ready to use. One factor to keep in mind is that the low profile on this couch may not work so well with people who have back or knee pain. However, if you’re generally pain-free, this won’t be a problem. 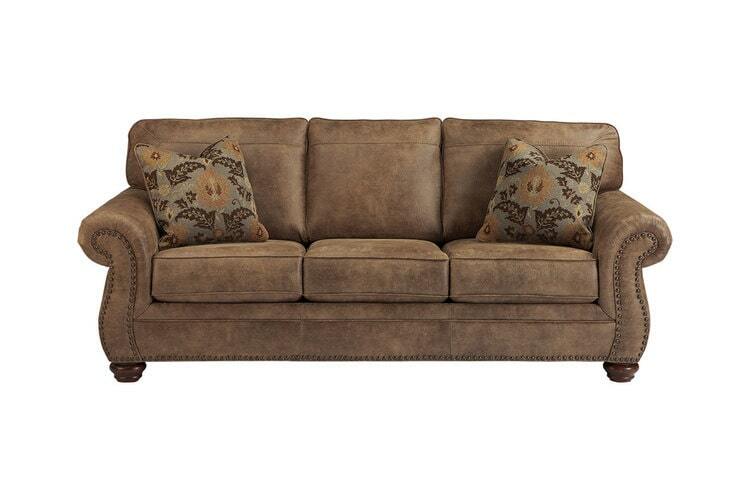 If you’re a fan of rustic-looking décor, you’ll probably appreciate the Ashley Homestore Larkinhurst Sofa Sleeper. While we just mentioned that the DHP Futon may not be suitable for people with knee or back issues, this sofa would be a good alternative if you have arthritis or other chronic pain problems. The couch is fairly high, so you won’t have to bend over when you sit down or stand up, making it easier on your body than some other sofas. The cushions on the Larkinhurst Sofa Sleeper can be removed and flipped as needed and the material on this couch is easier to clean than traditional fabric. This is a good choice for people who tend to have couples over to spend the night, as the bed folds out into a queen size. The mattress is made with memory foam and, if you’re dissatisfied with your purchase, you may return it within 30 days. It comes with an easy-lift mechanism for the pull-out bed, so setup is easy any time you need a spot for your guests to sleep. The Novogratz Brittany Sofa Futon is made from polyester with foam filling and has a comfortable cushioned back. 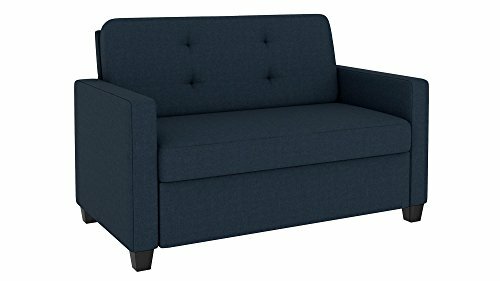 The slanted legs and frame are made from sturdy wood and the linen upholstery is easy to wipe clean. The couch has curved armrests that give it a stylish look that will fit in well with most living room arrangements. The fabric used on this futon is tough with an attractive color and the surface of the couch is firm, as is as the mattress. If you like a softer feel to your bed, you may want to use this with a mattress topper. Overall, this is a fairly priced, firm futon that could be a good investment for people with children or dogs, since it cleans so easily. Small and comfortable, the Room&Board Deco Convertible Sleeper is another sofa bed that will work well for rooms with limited space. The bed is easy to pull out and only requires one person, you just need to take off the couch cushions and fold the back down. The cushions can be stored under the seat in a convenient sling, along with blankets and sheets. This futon has a tweed-look created with multi-toned yarns and works well with queen bedding. If you prefer an armless couch for comfort reasons or a more practical reason like practicing guitar without obstacles in the way, the Room&Board Deco Convertible Sleeper could be your best bet. The Classic Brands Cool Gel Sofa Mattress is a plush bed that should work with most sofa beds as a replacement mattress. Although it’s made with memory foam, it was designed with gel and a breathable cover to provide a cool sleeping experience. You need a replacement mattress for an existing sofa bed: Since the Classic Brands Cool Gel Memory Foam Mattress doesn’t come with an actual pull-out sofa, it’s best for customers who already have their futon or sofa and just need to replace the mattress. You want your mattress to provide pressure relief: Memory foam provides a cradling effect for your body, creating sinkage and relieving pressure. If sleepers with back pain will be using this mattress, they’ll appreciate this. You’ll be having guests with allergies: If you have relatives who are sensitive to allergens and will be using your sofa bed, you’ll like that the Classic Brands Cool Gel Mattress is hypoallergenic. This means it’s resistant to dust mites, mold, and other potential irritants. You want a bed with a medium level of firmness: The Classic Brands Sofa Bed Mattress has a medium-plush feel, meaning it’s neither too soft nor too firm. If you plan to have a variety of guests sleep on your sofa bed, this firmness level should work for all of them. You sleep with a partner: Since the Cool Gel 4.5-Inch Sofa Mattress is made of memory foam, it absorbs motion very well. If you sleep with a partner or have a pet, this should help you stay peacefully asleep despite their movements. The Classic Brands Cool Gel Sofa Mattress has a cool knit cover, a 2-inch top layer made with breathable memory foam that cradles your body, and a 2.5-inch supportive base layer. These layers work together to create a comfortable, cool sleeping experience. This sleeper sofa bed has a medium level of firmness but, due to its memory foam design, some sinkage when you lie on it. This creates a slow response with enough support to keep your spine in a neutral position. The bed absorbs motion well and you likely won’t feel your partner tossing and turning in the night, even if you’re a light sleeper. The Classic Brands Cool Gel Memory Foam Sofa Bed has been CertiPUR-US® certified, meaning it was tested and found free from harmful levels of toxic chemicals. Amazon doesn’t offer a sleep trial period with this particular mattress, although it will come with a three-year warranty when you purchase it. This mattress can be used as a mattress topper, to replace the pull-out mattress in your RV, or as an ordinary sofa mattress. Before selecting the Cool Gel Memory Foam Sofa Bed, make sure you measure your pull-out and order the right size. The twin-size Cool Gel Sofa Mattress is 33 by 27 inches, while the full size is 53 by 72 inches, and the queen size is 58 by 72 inches. How You’ll Use it: How will you be using your sofa bed, primarily? Will it only be used by you? Is it mainly for sitting or sleeping purposes? And what’s the ideal height for your couch for the best level of comfort for all who will use it? Thinking over all of these questions will help you make the right choice. Cost: How much do you want to spend on your new sofa bed? If you’ll be using your couch a lot, you may want to invest in a more expensive model, whereas a budget model should work just fine for a sofa bed you’ll only use sparingly. Where You’ll Put it: Before making your purchase, give some thought to where you’ll put your sofa bed. You’ll have to consider not only how the couch fits in the spot you’ll want it in, but also how pulling the bed out will impact the space of the room. Size: Some sofa beds can sit four or more people, while others are smaller and can’t fit more than just two. Think about the size of your family and the guests you’ll be accommodating before choosing the best size sofa bed for you. Maintenance: The materials of your sofa bed will impact how you’ll care for it over time. With leather or faux-leather, a wet sponge will work, whereas fabric will require deeper spot cleaning. You’ll also want to rotate or flip the mattress in the bed every so often, to allow it to wear evenly. The Frame: Choosing a sofa bed with a quality frame is very important, as this will impact the overall life of the couch. Choose a frame made with durable materials, so the pull-out bed is likelier to stay stable over time. Firmness: Also, think about the feel and firmness you want your sofa bed to have. Most sofa beds that come with a fairly thin mattress, so if your guests prefer a plush feel, you may want to invest in a mattress topper. Living in a big city can mean having to opt for a smaller space and a sofa bed will help you conserve room in your apartment or house. Hopefully, this article was helpful for you in making your choice.